One of the best things about being in London in the summer is taking in the free music events, official and unofficial, along the South Bank of the Thames. Over the years, I have seen some really memorable gigs there, notably Natacha Atlas and A Man Called Adam, both of them outside the National Theatre with a fake lawn temporarily covering the concrete square. The weekend before saw the official reopening of the Festival Hall after its refurbishment. On the terraces outside we saw up and coming South London appalachian enthusiasts Indigo Moss and Billy Bragg doing a set of buskers standards such as Goodnight Irene and Underneath the Arches. 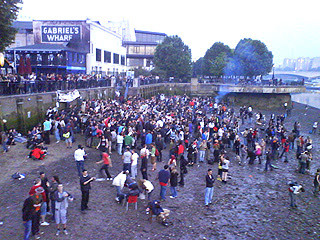 Outside of the official programe and further along the river, No Fixed Abode managed to get a sound system down on to the sand at low tide for a free party (pictured). There have been Reclaim the Beach events here since 2000. Yes, the Celebrating Sanctuary festival is on tomorrow (Sunday 15th June) on London South Bank (Bernie Spain Gardens), lots of free music from around the world. Not sure when the next Reclaim the Beach.